SERIES: Does your rebate agent do this? We know buyers have options, and our goal is to create value. Net you more, save you from buying the wrong place (ripe for a blog post), and find places you wouldn’t get elsewhere (off-MLS, coming soon, and Under Contract homes). And as I have said before, if you can find a rebate agent who can do that… use them (articles on Rebating). I LOVE UNDER CONTRACT HOMES. 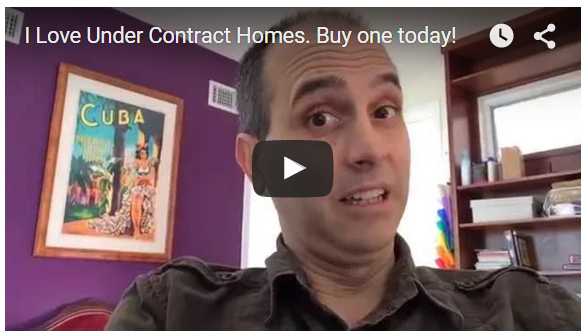 I want to consolidate and update previous posts on Under Contract homes (here and here). 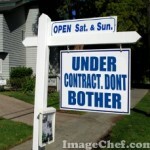 I think Under Contract homes are the biggest missed opportunity in real estate. 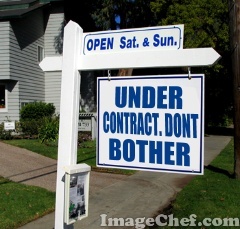 Just the other day a listing agent told me he listed all homes as “Contract” (will explain differences later). This incorrect category will remove his listing from ALL websites! And sure he said he would be open to a back up offer if somebody found it, ha, good marketing strategy “If somebody finds [the hidden home]”. Contrast that to every Frankly home changing the comments to read BACK UP OFFERS ENCOURAGED. Hum, still wonder what the differences are between Frankly and large companies, or even rebaters? Then keep reading. There are 3 types of Contracts on MRIS’s MLS system (the MLS equivalent of a drug lord, the data feed for most all sites). 1) Contract with Kickout. 10% of UC homes, 80% chance to win. This status is rare, but these are the EASIEST to win. Why? The “kickout” is a term in the contract that lets the buyer walk if the buyer can’t sell their own house. If a new buyer writes an offer, it CAN “kick out” the first offer. The first offer then has about 3 days to decide if they can risk removing that contingency. Most can’t. Then you win. This status for me, is almost the same as “Active”. There are many strategies on how to offer on these. Sometimes a $ amount over the current offer, or $10k BELOW the current offer (you can win on terms or money, see video preview here). You can search for Under Contract homes with a Kickout on Frankly.com, by adding the word Kickout. 2) Contract with No Kickout. 40% of UC homes, 20-30% chance to win. Why not try and offer on one? 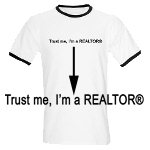 Well many/most buyers agents won’t, and listing agents won’t try and get one. Too much of a pain and too time consuming for them. Again, will your rebate agent do this? Maybe if you ask, but is that the mentality you want in a partner? Only if you ask them about winning your dream home?… what else do you need to “ask” for? It should come standard (insert trademarked tagline, Excellence Comes Standard). Megan, a Frankly broker, won her house that way. Do what the agents do! 3) “CONTRACT” 50% of UC homes, 15-25% chance to win. This status removes the home from most/all websites. Why a listing agent would do that is beyond me. It is supposed to be a status that is moved from one of the other two statuses when ALL CONTINGENCIES have past and the deal is “almost closed”. Do you think most agents want to change the status 1 extra time? Many who use this are just lazy and it HURTS YOUR SELLER!. You can still offer on these, but your chances might be a little lower, but again, they might not be. Your agent can find them on the back end MRIS lookup and if you see an Active home suddenly disappear, that might be why (that or it was withdrawn, expired, ie the listing agent was fired). Sellers: Make sure your agent keeps working well beyond putting the home under contract. Or better yet, just make sure you have a Frankly agent. This can NET you significantly more, but it takes much more effort on the agent’s part. And many have already moved onto the next listing. Buyers: Why not try? Give it a shot. If you are a back up offer, you can still void it if you find something else (unless it is made into the primary offer). These extra things that Frankly agents do will make a world of difference. I get it that most think buying a home is like buying a pack of Charmin at Target, but there is so much more to helping get you in the right home. And like always, reach out MONTHS before you think you might be interested. Don’t settle for a Popcorn agent. Principal Broker Owner Frankly.com Realtors. Ps. Are you a rare like-minded full time experienced agent? Want to join Frankly? We need more agents in Baltimore, DC, and PG County. Tags: Rebate Agent Do This?